Increasingly brands want to know whether people think about social purpose when shopping, whether it lifts their moods or if they talk to others about it. Sometimes asking people about it in surveys may not yield accurate results: people often don’t register what they are thinking about, and may not realise that social purpose matters to them. Others may virtue signal, and exaggerate the importance of brand social purpose to them. And lastly, social purpose can have a different effect on different groups of people. Thankfully, whilst still not perfect, actual data of conversations on social media can help understand whether social purpose matters to people engaging with different brands, and what effect it has on them. I looked at over 14,000 tweets in the last 30 days, mentioning UK supermarkets: Aldi, ASDA, Lidl, Morrisons, M&S, Sainsbury’s, Tesco and Waitrose. Using IBM SPSS Modeler Text Analytics package, I extracted over 5,000 concepts from these tweets and organised them into 100 themes/categories, ranging from food, drink, taste, price, customer service to emotions, employment desirability and social purpose. When tweeting about Social Purpose in the context of UK supermarkets, people mentioned 15 different types of action, including fundraising for/donating to charities, paying fairly to staff and suppliers, improving communities and lives, helping victims of disaster emergencies, staff volunteering for charities and local communities, protecting the environment, ensuring sustainable food supplies and supporting food banks. Present in 5% of all tweets, social purpose ranks joint 5th amongst key themes, behind food, other products, and location but on-par with customer service and offers, and ahead of wine (! ), problems and online shopping. 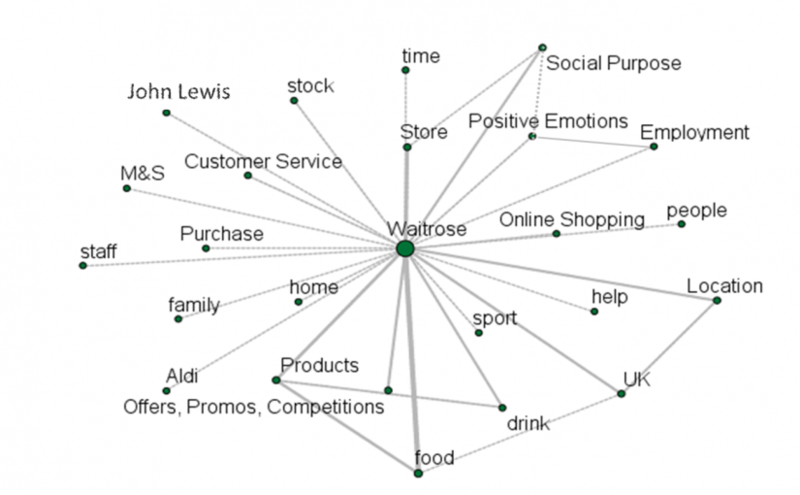 Text link analysis showed that social purpose was most likely to appear in tweets about Tesco, Waitrose, Sainsbury’s and M&S. It was also linked to other themes, e.g. staff, produced in the UK, plastic bags, etc. Waitrose punches above its weight when it comes to being mentioned in tweets with a social purpose theme. 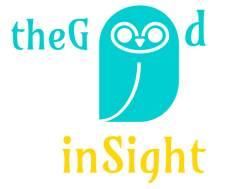 It was mentioned in 11% of all tweets but 25% of social purpose tweets, giving it an index of 233. Tesco’s was mentioned in a whopping 41% of social purpose tweets, although a third of those were negative, accusing the retailer of pocketing plastic bag charges. M&S is underperforming relative to its overall tweets share, giving it an index below 100. 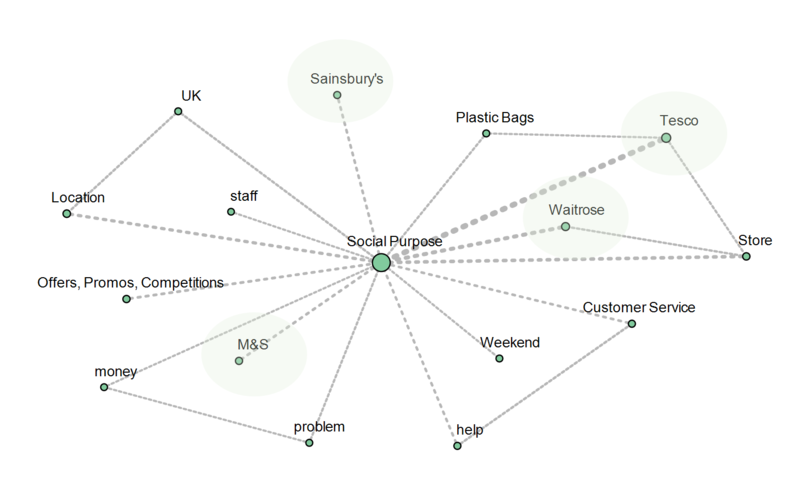 For Waitrose and people tweeting about it social purpose is hugely important, present in 13% of tweets and ranking 3rd only behind food and store environment. 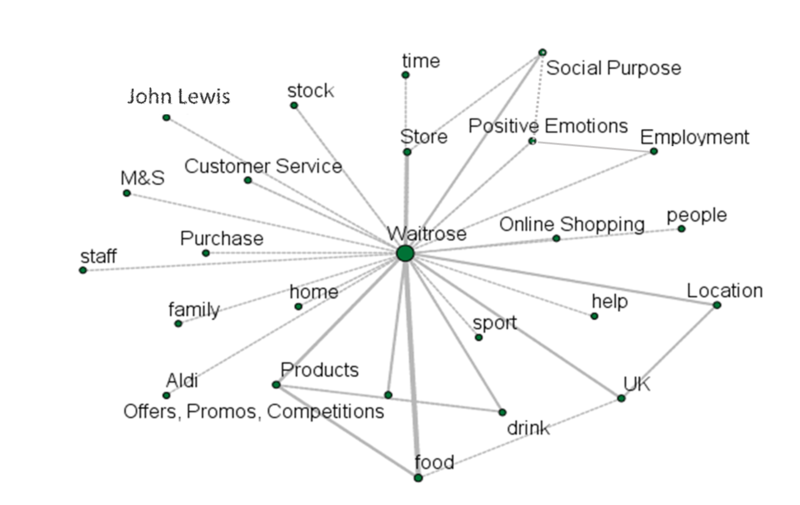 Text link analysis shows that social purpose is interlinked with other themes. Most importantly it shows that social purpose makes people feel and tweet positively about Waitrose. It also makes them want to work for it. Overall, premium and mid-market food retailers have higher social purpose indexes vs those competing on price. One could argue that this could be explained by their customers’ greater levels of interest in social purpose. However, most likely this is due to the brands’ own levels of engagement in social purpose activities, how consistently they live this purpose and how they communicate it to the outside world. This would also explain variations within each category: Waitrose vs. M&S, or Tesco vs. Sainsbury’s. 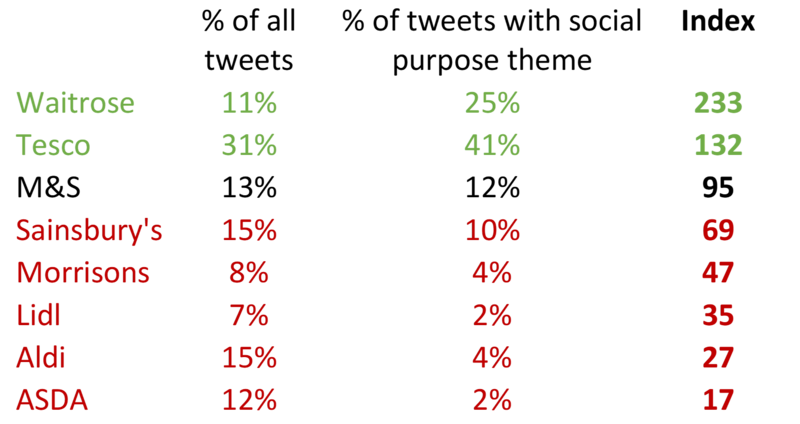 And with one-third of regular Waitrose customers also shopping in Lidl (Kantar/TGI), consumer segments are now shared, and there’s nothing stopping brand getting behind social purpose.